Greetings from warm and sunny Lusaka, Zambia, from your ELCZa missionaries, Rev. Deborah and Dr. Joe Troester! We are happy to announce that we will be in the U.S. this coming summer and are almost ready to start scheduling church visits. Look for an e-mail from us soon with more details. Typical offering in Zambezi of chickens and bananas. Our work has kept us busy here, mainly supporting the leadership of the Evangelical Lutheran Church in Zambia. Rev. Geoffrey Njapau was elected the new senior pastor (similar to a bishop) in May, 2018. He and Deborah, along with other church leaders, have been visiting congregations all over the country to get to know them and to meet local church leaders. This past fall we traveled up to the Copperbelt (Central) Region and to Northwestern Zambia (Zambezi Region), then back to Lusaka, visiting about a dozen congregations in less than two weeks. 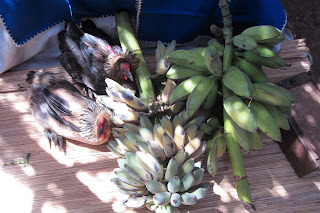 We were joyfully received, with enthusiastic church services and gifts of bananas, cassava, chickens, and even a goat! 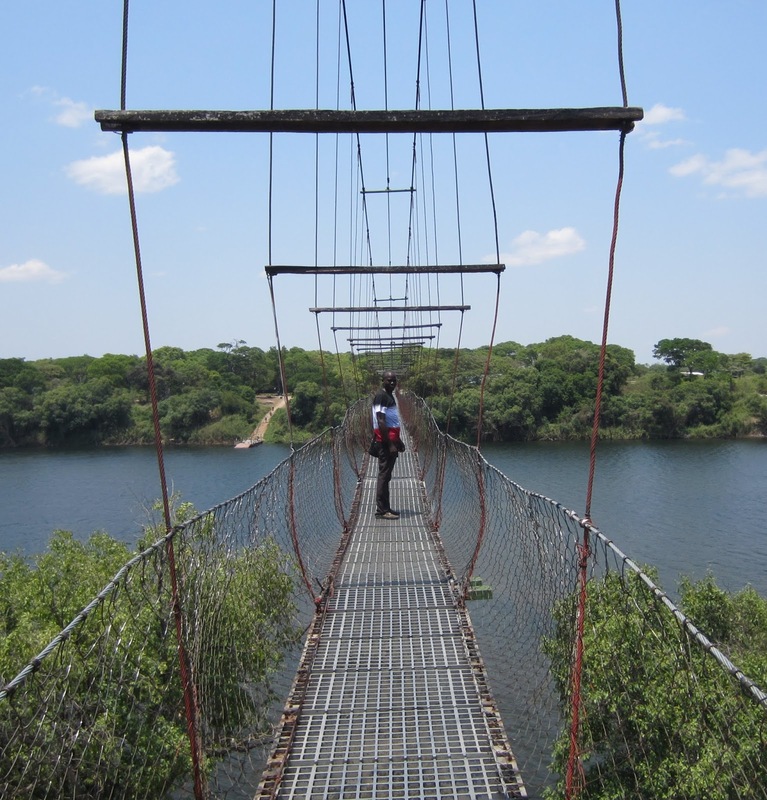 To reach one of the congregations, we had to cross a 275-yard pedestrian suspension bridge over the Zambezi River. Thankfully, we did not see any of the crocodiles rumored to live beneath it! Deborah spoke on the Reformation and Martin and Katy Luther at each congregation we visited. Many parishioners commented that they had learned for the first time why the church had the name “Lutheran.” They were proud to learn of their 500-year heritage, and one leader said that he felt the reforming spirit of Martin Luther in their church, encouraging them to greater achievements! 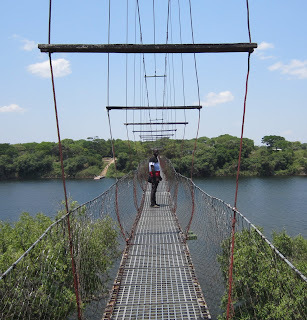 Suspension bridge across the Zambezi River (the fourth-longest river in Africa). Deborah also spoke at a women’s conference in southern Zambia on the role of women in the church. Spending two nights in a rustic mud-brick sanctuary, with a thatched roof, sleeping on the floor and eating locally prepared nshima (corn meal mush) with chicken or fish was definitely a cultural immersion experience! The highlight of the conference was the baptism of an elderly lady, Martha, whose daughter had brought her to the conference. Rev. 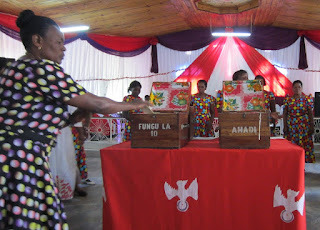 Matildah Banda, general secretary of the ELCZa, and Veronica Malakibungu, ELCZa women’s chairperson, were organizers of the conference, along with the local women’s group. Martha (pictured in the middle with friends and relatives) on her baptism day at the women’s conference in southern Zambia. The youth are also active in the ELCZa. They requested Deborah to preach at their end of the year conference in Chongwe, about an hour east of Lusaka. 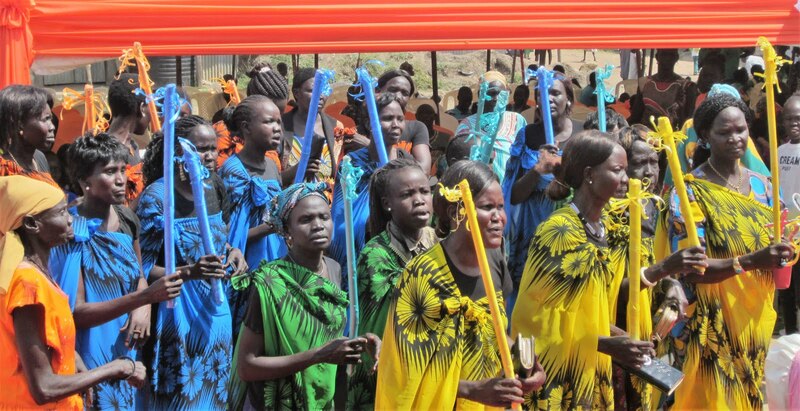 The theme was “Using Your Gifts for God.” In Africa, “youth” includes what we in the ELCA would term “young adults.” The youth are eager to plan their own activities and do fund-raising themselves to support their conferences and camps. Deborah will be speaking on the theme of leadership during Youth Sunday celebrations this month. In all of this, we thank God for you—for your prayers and for your financial support. We couldn’t do it without you! If you wish to support us, you can give through your local congregation or through our new ELCA Missionary Sponsorship Page. Joe and Deborah are ELCA missionaries living in Lusaka, Zambia, where they are serving with the Evangelical Lutheran Church in Zambia (ELCZa). Their daughter, Christa, is a junior at the University of Southern California, where she is studying French and Film & Television Production. 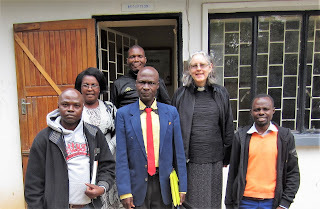 We are settling in to our new home in Lusaka, Zambia, and getting to know the leadership and members of the Evangelical Lutheran Church of Zambia. The weather has warmed up, as winter in the Southern Hemisphere draws to a close, and the beautiful purple flowers of the jacaranda trees are everywhere. In the past few weeks, we have been privileged to visit two rural congregations. 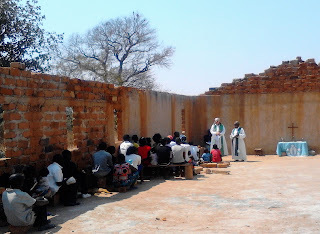 Mulimba, a village about 50 miles west of Lusaka, is pastored by Rev. Doreen Mwanza. Deborah preached and Pastor Doreen translated into the local Tonga language. There was a lot of special music from the youth choir. Although the congregation is small, they were enthusiastic and friendly. As you can see in the photo, some time ago the wind destroyed the roof of the church building, and the parishioners are forced to worship out in the open, rain or shine. At least the walls provide a bit of shade! Rev. Deborah preaching at the Mulimba Congregation. Her sermon is being translated into Tonga by Rev. Doreen Mwanza. Afterwards, Pastor Doreen invited us for lunch in her home next to the church. We had fried chicken, fresh greens from her garden, and the traditional nshima (made from corn meal—similar to grits or polenta). We were also treated to a traditional (non-alcoholic) beverage called munkoyo, made from the roots of the munkoyo tree (Rhynchosia venulosa, for those gardeners who are interested). 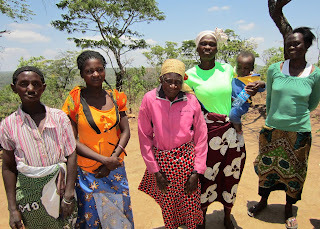 This past Sunday we made a trip to the village of Mulendema, also west of Lusaka. We were called to worship by the ringing of a gong, hanging from a tree outside the church. Evangelist Darius Munduwe led the service, and again, Deborah preached. Rev. Matildah Banda, General Secretary of the ELCZa, translated the sermon into Nyanja, another local language. All in all, there are five or six languages used by congregations of the ELCZa, depending on which language group makes up the majority of the congregation. Rev. Deborah preaching at the Mulendema Congregation. Her sermon is being translated into Nyanja by Rev. Matilda Banda, the General Secretary of the Evangelical Lutheran Church in Zambia (ELCZa). Afterwards, we were again served a delicious lunch. As we were about to leave, a member of the congregation presented us with a live chicken! (We appreciated the gift but gave it to Rev. Banda to take home with her.) We arrived home late in the afternoon, tired, hot, and dusty, but happy that we had made some new friends. As some of you may know, our ministry with ELCA has recently taken a new turn. After serving as ELCA’s East Africa Regional Representatives for four and a half years, we were asked to consider a move to Zambia, to assist the Evangelical Lutheran Church in Zambia (ELCZa) with their educational and leadership development needs. To make a long story short, we accepted the invitation and have recently arrived in Lusaka, a beautiful city not far from the iconic Victoria Falls. Lusaka is also the headquarters of the ELCZa. This small church, established in 1983, has endured many struggles throughout its history, but now is on firmer footing, having just elected a new lead pastor (similar to a presiding bishop) and leadership team. ELCA Global Mission has been searching for someone with the right skills to accompany this church for over three years now, ever since the former missionary had returned to the U.S. Joe and I bring twelve years of experience living and serving in Africa to this position, and the ELCZa has welcomed us with open arms. We hope that our knowledge and experience may assist this church as they seek to strengthen their impact in Zambia. We have been warmly welcomed by the church leadership and local pastors here in Lusaka. We have visited three nearby congregations and hope to visit the more far-flung parishes during the coming months. Stay tuned for more news. Our e-mail addresses have not changed, so feel free to contact us at Deborah.Troester@elca.org or Joe.Troester@elca.org. Photo 1: Rev. Deborah preaching at the Garden House Congregation. Her sermon is being translated into Nyanja by Rev. 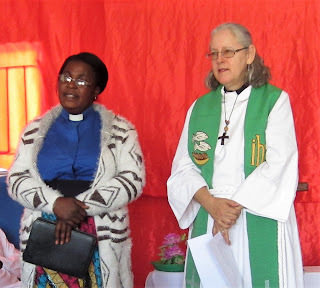 Matilda Banda, the General Secretary of the Evangelical Lutheran Church in Zambia (ELCZa). Photo 2: Rev. Deborah and the management team of the ELCZa. From left to right: Finance Chair David Mangenda, General Secretary Rev. Matilda Banda, Treasurer Bernard Mapulanga (in back), Lead Pastor Rev. Geoffrey Njapau, Rev. Deborah Troester, Assistant General Secretary Dr. Evans Lombé. Joe and Deborah are ELCA missionaries living in Lusaka, Zambia, where they are serving with the Evangelical Lutheran Church in Zambia. Their daughter, Christa, is a junior at the University of Southern California. For our January blog, we would like to give a glimpse of some of the many things we did in 2017 as ELCA East Africa Regional Representatives. Part of our work involves visiting our partners here in East Africa, encouraging them in their work, and reporting back to Global Mission and our supporting churches about the great things happening here on the ground. We had visited Bishop Mameo of Morogoro before, but in October it was time for another visit. 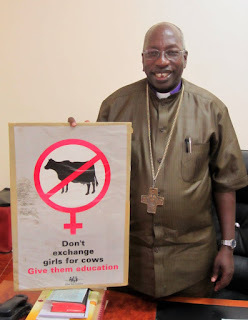 A Maasai by birth, Bishop Mameo’s family tradition includes raising large herds of cattle. Sometimes cattle are exchanged for a bride in this culture, often leading to early marriage, so that the girl’s father can increase his herd. This usually means an end to the girl’s education. Bishop Mameo stands up against this tradition. We love this poster that he keeps in his office! Deborah had the chance to chat with him about the ELCA’s International Women’s Scholarship Program, which sends young women from our partner churches to four-year Lutheran Colleges in the U.S. Bishop Mameo is hoping that a couple of young women from his diocese may benefit from this scholarship, and he is encouraging good candidates from his diocese to apply. In November Lake Tanganyika Diocese in southwestern Tanzania was on our agenda. This is a new diocese without many outside partners. ELCA-Global Mission has supported the Women’s Ministry of this new diocese, enabling them to purchase a farm that will serve as a place to grow vegetables and develop bee-keeping. Above is a photo of some of the women of the diocese, proudly displaying their products for sale: baskets, beadwork, fabrics, home-made bread, and honey. Funds go to promote the Women’s Ministry and to assist community members in need. Another part of our work is helping and encouraging our fellow ELCA missionaries in East Africa. In March, colleagues Dr. Steve and Bethany Friberg celebrated the inauguration of a new Women’s Center in Ketumbeine, where Dr. Steve serves eleven rural clinics. 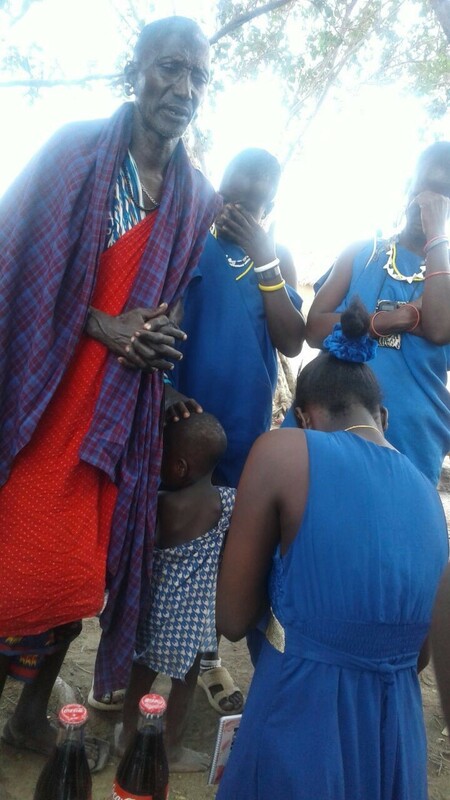 Bethany has worked with the women of their village for twenty years now to develop a bead-making project. Sales from the project have enabled over fifty children to attend school—some even have graduated from college! 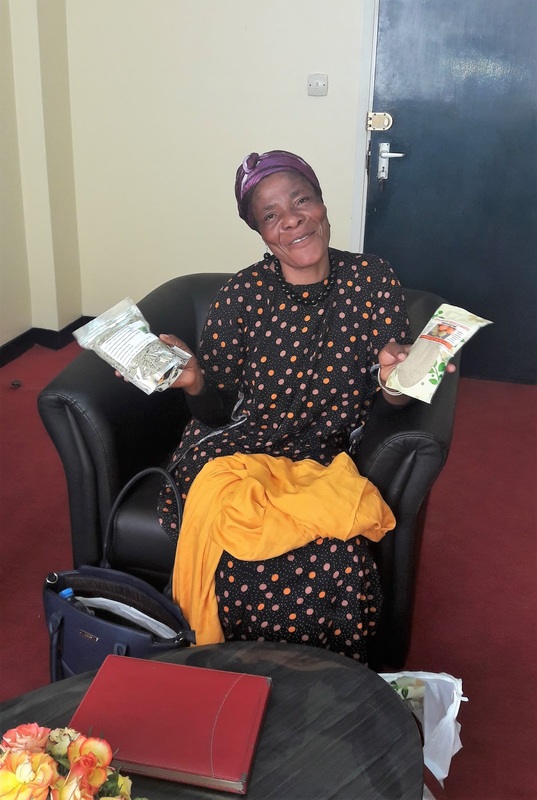 The money has also helped the women buy goats and other livestock, so that they can earn some extra cash from the goats’ milk or sale of its offspring. This raises the standard of living for the whole family. In September we were blessed by the visit of thirteen people from ELCA Mission Advancement: nine ELCA church leaders and four ELCA staff members. 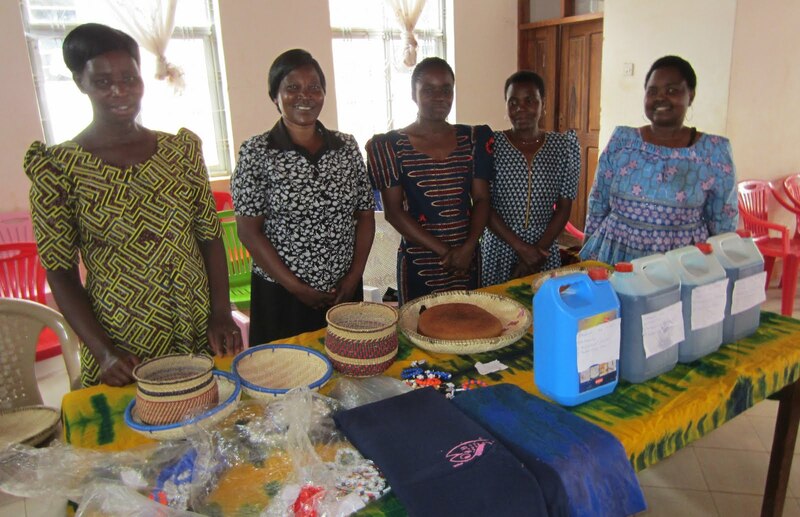 They were touring ELCA-sponsored projects in Tanzania and Rwanda. We helped organize their visit, and assisted in making some videos showing the work of several ELCA missionaries and local partners. They visited the Headquarters of the Evangelical Lutheran Church in Tanzania, and met its leaders. 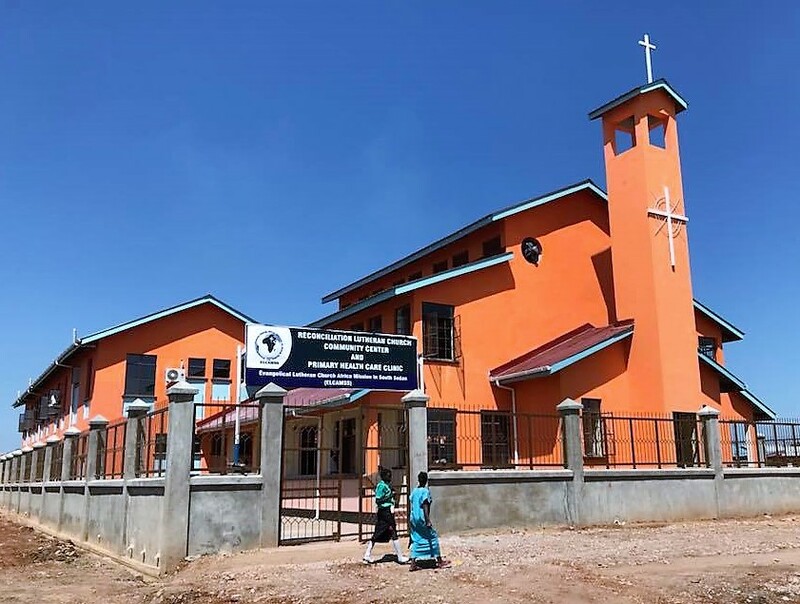 Finally, perhaps the biggest project in our region was completed and inaugurated this past November 16: The Reconciliation Lutheran Center in Juba, South Sudan. This beautiful center includes a sanctuary for worship, office space, classrooms, and a clinic. 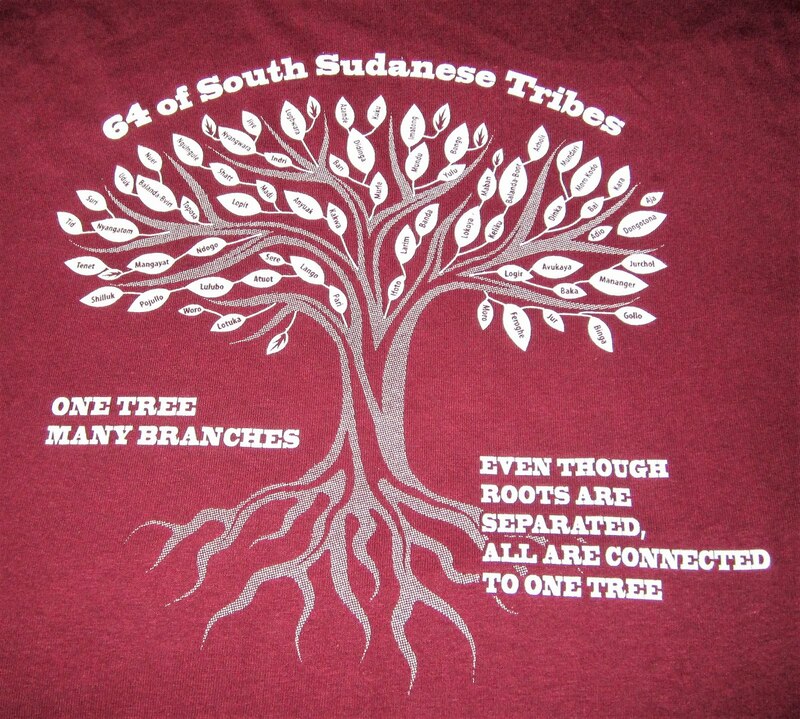 The project has brought together people from several of South Sudan’s warring ethnic groups. Together we worshiped in peace as the center was dedicated. 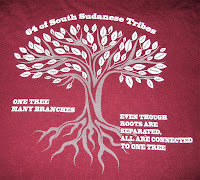 A special t-shirt was made for the celebration, and people danced in the street before enjoying a huge meal together. So maybe this gives you a taste of what we did in 2017. We thank all of you for your continued support and prayers that made all of this, and much more, possible. 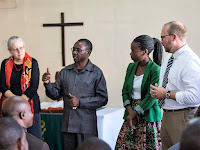 Joe and Deborah are missionaries living in Arusha, Tanzania, where they are the East Africa Regional Representatives for the Evangelical Lutheran Church in America and work in Tanzania, Kenya, South Sudan, and Uganda. Their daughter, Christa, is a sophomore at the University of Southern California. Tumshukuru Mungu—We thank God—is a phrase we often hear in Tanzania. Tanzanians don’t celebrate Thanksgiving as a once-a-year national holiday, yet, in their everyday lives, they often express gratitude to God for their blessings. Nearly every church will have a special Sunday for Thanksgiving, usually around the time of the corn harvest in October. Also, people who want to show their gratitude to God for a special blessing, such as recovery from an illness, will often make a special offering. They will come to the front of the church to present their gifts, receive a special blessing and perhaps give a testimony of God’s goodness in their lives. 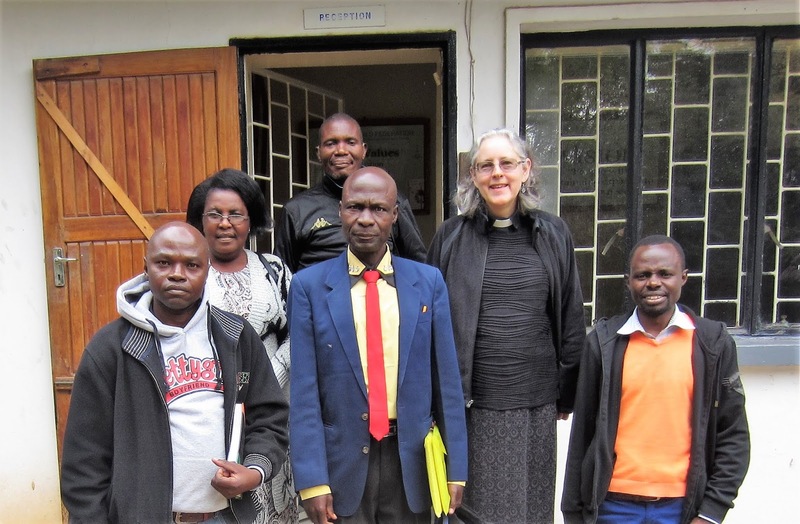 Recently Deborah was visiting Sumbawanga, the headquarters of Lake Tanganyika Diocese, one of the newest dioceses in the Evangelical Lutheran Church of Tanzania. When it came time for the offering, people came singing and dancing up to the front to place their offering in a wooden box. 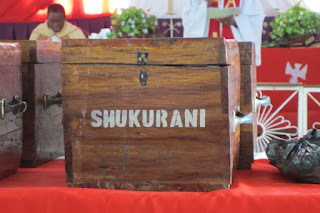 The photo above is of the box labeled, Shukurani—Thanksgiving Offerings. There are other boxes for different kinds of offerings, such as tithes and pledges. As is often the case in Tanzania, people also brought up sacks of corn, watermelons, eggs, and even two live chickens. The women of the church had baked about a dozen loaves of bread. Some people brought handcrafts they had made themselves. These items were auctioned off after the service and the sale price was added to the offering. In this way, people with little cash on hand could still contribute to the work of the church. Church in the U.S. might be a little more interesting if we had this custom! As we approach Thanksgiving, we are especially thankful for visits from folks from the U.S., including a group from ELCA Mission Advancement in Chicago who came to visit projects and missionaries sponsored by the ELCA and to make some videos of mission work in Tanzania. 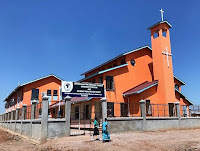 We are also thankful for safe travels around Tanzania, a trip to Nairobi to visit the Kenya Evangelical Lutheran Church, and a safe journey to South Sudan, for the dedication of the new Lutheran Center in Juba. We are especially thankful for our wonderful supporters in the U.S., many of whom we got to visit this past summer. Whatever you are thankful for, we pray that you will have a blessed Thanksgiving. Remember, Tumshukuru Mungu! 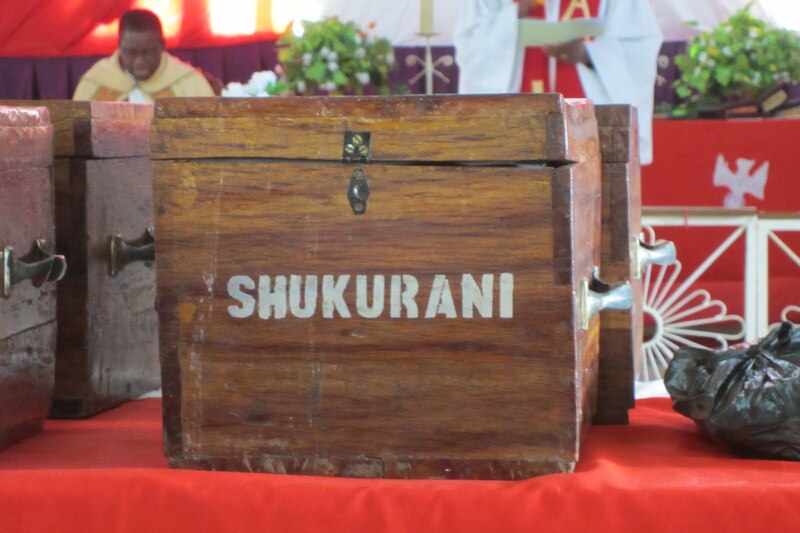 Top Photo: Offering box at church in Sumbawanga, Tanzania labeled Shukurani (Thanksgiving in Swahili). Middle Photo: Offering boxes at church in Sumbawanga, Tanzania labeled Fungu La 10 (tithes) and Ahadi (pledges). 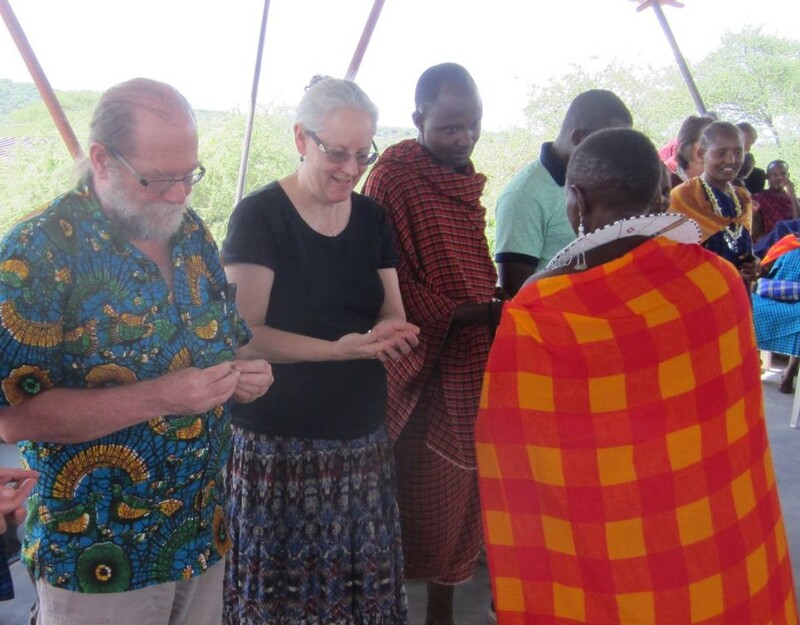 Joe and Deborah are missionaries living in Arusha, Tanzania, where they are the East Africa Regional Representatives for the Evangelical Lutheran Church in America and work in Tanzania, Kenya, South Sudan, and Uganda. Their daughter, Christa, is a sophomore at the University of Southern California this fall. This summer we plan to visit congregations and other community gatherings to give a presentation on our work for the ELCA in East Africa. 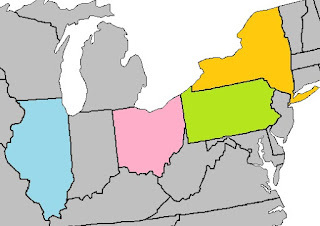 We will concentrate our visits on our supporting congregations in Illinois, New York, Ohio, and Pennsylvania. Our itinerary is below; however, there are still a few events pending. We are greatly looking forward to meeting new people and greeting old friends. Joe and Deborah are missionaries living in Arusha, Tanzania, where they are the East Africa Regional Representatives for the Evangelical Lutheran Church in America and work in Tanzania, Kenya, South Sudan, and Uganda. Their daughter, Christa, will be a sophomore at the University of Southern California School of Cinematic Arts this fall.